Oh Kagura, it's been a while since you got any attention, and I guess having an illness was the only way for you to get the spotlight before the Shogun Assassination Arc gets under way. As you can see from the name of the arc, someone is "ill", and from what I just said, it's Kagura. The story behind the ars is that the heat is turned up many notches, and everyone is feeling it, in particular Kagura given that she's a Yato. A few minutes in and she's admitted to hospital where Gintoki tries to take care of her, regretting his actions from earlier. But her "condition" takes a turn for the worse and next thing you know, the gang turns up to pay their respects in Kagura's "final moments". Even Sadaharu. He's cute even when he's upset. Whoever thought that an arc in a hospital could be so hilarious? Kagura is trying to mess with Gintoki and Shinpachi by pretending she's feeling worse than she actually is to see whether or not they care about her, while Gintoki tries to tend to Kagura (and others (ouch!)) as much as he can. I like how Kagura's revenge act to see if they care for her completely backfires right in front of her eyes as things do not go as she planned. Anyway, after all the funny parts come slightly sad ones when everyone turns up as Kagura is deemed to be in a coma by the doctor even though her heart rate and what not are completely fine. And while everyone is upset and arranging her funeral, Gintoki tries to act all serious and punches the wall every time someone says something to him, mentioning Pachinko when money is the subject of the conversation. Hey, if this is how he's taking Kagura's situation, let him be! I guess he's thinking about how such a small act against Kagura had such a huge impact on the girl, bless him. And Pachinko. So while all this is going on, Toshi, Kondo and Sogo make an entrance with Princess Soyo, who is such a gullible child, especially when Sogo is around. By this I mean Sogo "arranges" Kagura's funeral just before Kagura decides to make a revival entrance, and the comedy returns. Sogo's sadistic streak plays a huge role through the rest of the arc, and I have never laughed so much from watching other things while taking a break from Gintama, and poor Kagura can't exactly say anything to stop everything. Sogo's plan just ends up confusing everyone as they try to pay their respects in a very unique funeral, and in the end he gets his way. It's absolute perfection. This was an excellent and hilarious arc to come back to after my time away from Gintama. 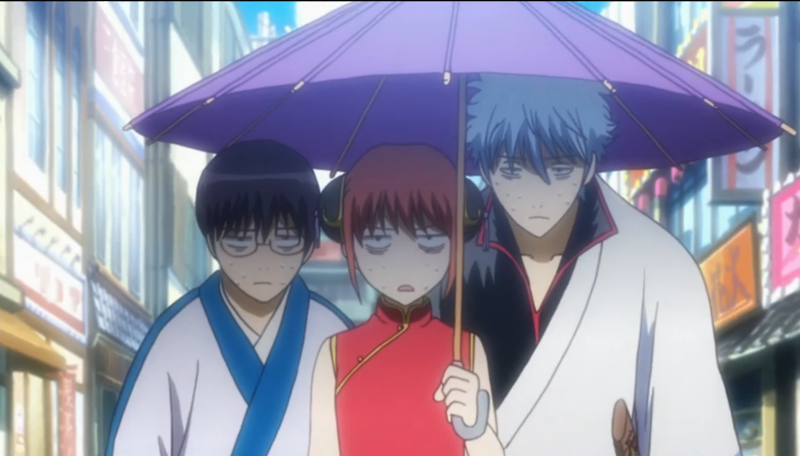 All that's left now is the Gintama special episode, which I will review before I get to the Shogun Assassination arc. The preview looked amazing, and I now understand the hype from all the tweets I've read while I was busy with other anime and commitments. Let me know what you guys thought of the Shogun Assassination arc in the comments, and what you thought of this arc.